Finished Apr 2019. Final score: 4 / 5. An interesting book that is worth the short evening to read it. When looking at the absolute best of the best of a particular field (sports, science, education, entrepreneurs, etc), one might assume these "Outliers" achieved their amazing success through pure grit or innate ability. After all, in America, we like to think everybody has a a chance of reaching the top of their chosen field "if they are willing to work hard enough" with whatever natural talents they were born with. Malcolm Gladwell makes the case that this isn't telling the entire story. Malcolm says that grit and innate ability is import, but what gets left out is the incredible opportunities given to these outliers. He starts the book with what I thought was the most interesting case: Canadian hockey players. (Malcolm Gladwell is from Canada). Why is a very large percentage (some teams over 50%) of pro hockey players born in the first couple months of the year? They are skilled and work hard, but there as to be some structural reason why a third of the team was born in January and nobody was born in the last quarter. It is simple, youth hockey teams have their age cut-off January 1st. By the time the next year rolls around, the January birthday kids are nearly a full year older than their peers. They are a full year stronger and mature. They get accepted to the elite clubs, and that just kick-starts a trajectory of excellence. By sheer luck of the birth date, these kids have a major advantage of their peers, and they continue to carry it all the way to pro league. 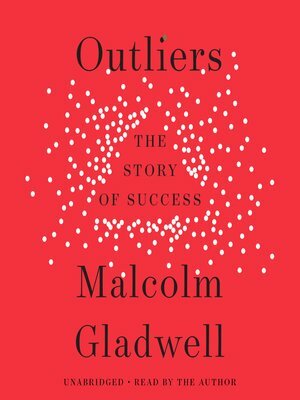 Outliers is a collection of stories outlining extreme situational advantages that is often missing success stories. Bill Gates had daily access to a really nice computer as a child during a time when many colleges did not have them. The Beatles had a club they could perform in (or practice) for as long as they wanted for as many days as they wanted. There are more stories. Discuss Outliers in the forums.